The Department of Land and Natural Resources (DLNR) announces an open fishing season for rainbow trout in the Koke'e Public Fishing Area (PFA) on Kaua'i, beginning Saturday, July 2, 2011. Anglers may fish daily during the daylight hours between sunrise and sunset from July 2 to September 30, 2011. "Trout fishing at Pu'u Lua Reservoir in Koke'e has always been a popular family activity and anglers will have a chance to catch trout from last year's stocking," says William J. Aila, Jr., Interim DLNR Chairperson. Last year 1,866 anglers caught 8,629 trout which averaged 14 inches in length and 1 pound 8 ounces. Anglers must have a valid State of Hawai'i freshwater game fishing license. Licenses may be obtained at DLNR offices, at selected fishing supply stores, license agents, or purchased online at //www.hawaii.gov/dlnr/dar. Online license purchases are encouraged due to shortage of State personnel. 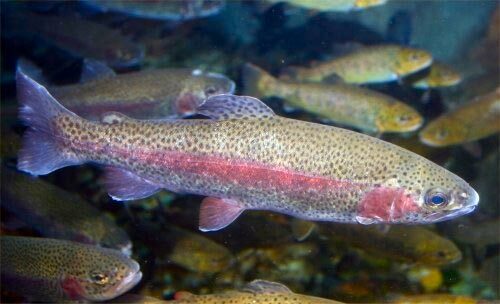 The daily bag limit is five rainbow trout per licensed angler. Anglers shall fish with only one pole and line, or with one line with one lure or one baited hook attached to one line. The use of treble hooks is prohibited. The complete rules for fishing for rainbow trout at Koke'e PFA can be found on the DLNR website listed above, or by calling any Division of Aquatic Resources office. Anglers should be aware that a four-wheel drive vehicle is recommended for driving to all main fishing areas, including Pu'u Lua Reservoir, the streams and ditch systems. Trail 2 for the lower ditch systems. For further information or the current list of license agents, please call the DLNR Division of Aquatic Resources on O'ahu at 832-5009.